Transportation • City aims to dismiss lawsuit challenging contracts awarded to out-of-state cab companies. Al Hartmann | The Salt Lake Tribune In October, a judge issued a temporary restraining order blocking the taxi plan until legal challenges on the fairness of the bidding process could be heard. The order effectively put on hold new and upgraded taxi services, which had been scheduled to begin last November. A 3rd District Judge is considering a request that would allow two out-of-state cab companies to take over taxi services in Salt Lake City. On Wednesday, Judge Kate Toomey took under advisement the city's motion to dismiss a lawsuit by the Utah-based Yellow Cab and Ute Cab companies that seeks to delay Salt Lake City International Airport from implementing a plan that would affect taxi services in the Salt Lake Valley. In October, Toomey issued a temporary restraining order blocking the plan until legal challenges on the fairness of the bidding process could be heard. The order effectively put on hold new and upgraded taxi services, which had been scheduled to begin last November. Toomey said Wednesday that she had anticipated seeing attorneys for further arguments to resolve the issue "a week or two" after she had signed the order. So far, however, the city's administrative board has not set a date in the latest round of appeals. Senior City Attorney Wesley Robinson argued Wednesday that case law and city ordinances do not support claims by the Utah cab companies that the bidding process had been unfair. He also said Salt Lake City Mayor Ralph Becker did not exceed his authority by turning over taxi regulatory responsibilities to the airport, including additional cab concession fees to be charged citywide for taxi services. But Yellow Cab attorney Don Winder said the city has repeatedly violated its promises that no contracts would be awarded until administrative appeals are exhausted. Winder also said airport concession fees should not be borne by city residents not using the airport, including elderly and disabled people who call taxis for trips to grocery stores and medical appointments. There is no consensus on whether taxi rates will increase under the new contracts. But a study commissioned by Yellow Cab and conducted by the Salt Lake-based consulting firm Wasatch Economics claims rates will go up by as much as 40 percent. Last year, airport administrators awarded new contracts to the Cleveland-based Ace Taxi Service and Total Transit, headquartered in Glendale, Ariz. Under the new contracts those companies' taxis would be the only ones allowed to queue up to transport passengers from the airport or pick up riders anywhere in the city on demand, meaning no prior arrangements need be made. 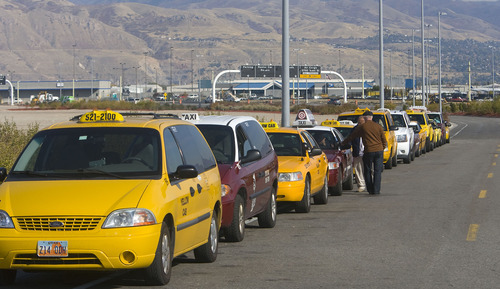 In 2006, the City Council voted to terminate its longtime permits, called certificates of convenience, with the Yellow, Ute and City cab companies. Despite uncertainties over the certificates in the ensuing years, the cab companies have continued to provide services. Last year, the Department of Airports said various companies submitted proposals, which were ranked by a seven-member voting panel based on six criteria  quality of service, driver programs, operational plan, prior general and specialized experience, fees and financial performance. The Salt Lake cab companies said the bidding process put local companies at a competitive disadvantage.